Probably later 13th century. Partially remaining undercrofts of 2 separate parallel rectangular ranges running N/S; each with narrower remaining 2-bay elevation to S. Gothic; lancet windows with moulded arches (those to dorter joined by string course); splayed internally; remains of rib vaulting. Coursed dressed sandstone with ashlar dressings. Stepped base courses to both ranges. REREDORTER: S ELEVATION: 2 windows; that to right partially intact. Remains of flanking buttresses. W ELEVATION: single window to S; remains of buttress to right. Otherwise adjoins bank of earth supporting churchyard. N ELEVATION: adjoins bank of earth supporting churchyard. E ELEVATION: foundations only extant. Remains of drain channel adjacent. INTERIOR: 4 bays in length; bays divided by chamfered wall shafts of vaulting. Fireplace to 2nd bay from S in W wall; triangular-headed entrance to adjacent bay to right. Inserted entrance to N wall. DORTER: S ELEVATION: 4 windows; remains of central buttress and flanking buttresses. W ELEVATION: S wall of frater range adjoins at right angles to N. 2 and a half bays to S divided by remains of buttresses; 2 windows to outer right bay; one to left; entrance with moulded Gothic arch to N of S wall of frater range, opening into lobby of frater undercroft. E ELEVATION: Most of wall buried under churchyard. Single extant window to S. Buttress to left. N ELEVATION: buried underneath churchyard. INTERIOR: largely obscured by protruding embankment wall supporting churchyard. Bays divided by circular wall-shafts and subdivided by conical corbels formerly supporting sexpartite rib vaulting. Stone bench along wall. Property in care. A-Group with Dunfermline Abbey, Nave, New Abbey Parish Church, Gatehouse, Frater Range, Palace and Kitchen and Entrance Gateways and Boundary Wall (see separate list descriptions). 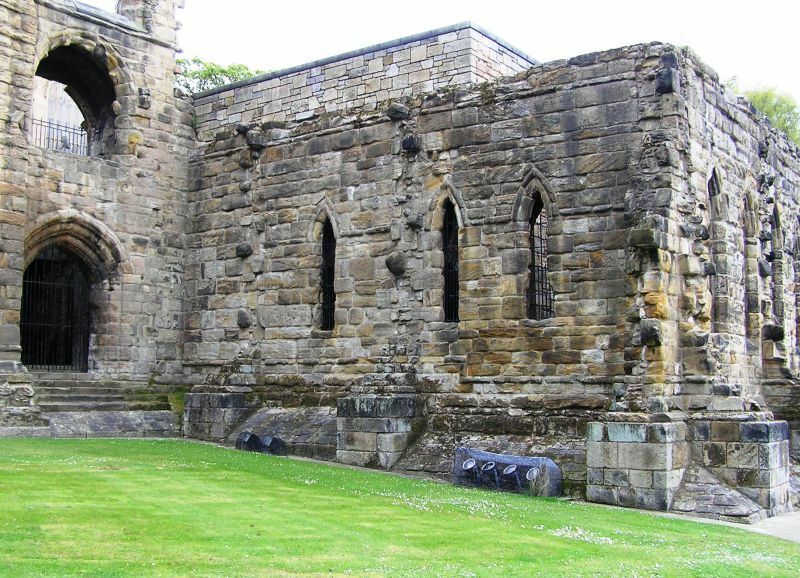 A Benedictine priory was established in Dunfermline in around 1070 by Queen Margaret, wife of Malcolm III. It was upgraded to an abbey by her son, David I in 1128. In 1304 the monastery buildings were partly destroyed by Edward I during the Wars of Independence. Judging by their existing remains, the dorter and reredorter were included in 'the few houses for monks' that were left standing.